How to find a part from the categories displayed? What if I do not see the part I am looking for in the categories I have searched through? Why am I prompted to specify my vehicle? How do I locate a part from the category I've selected? 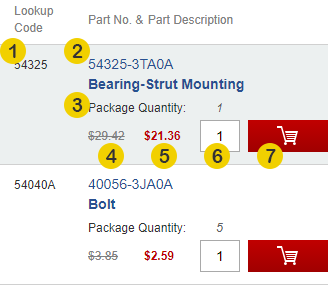 What if the parts listed in this page do not have the part I need? I'm on the part diagram page, what do these fields mean? How can I see an expanded part diagram view? The part I'm looking for has multiple listings, what do I do? I see multiple part illustrations, which illustration is for my application? 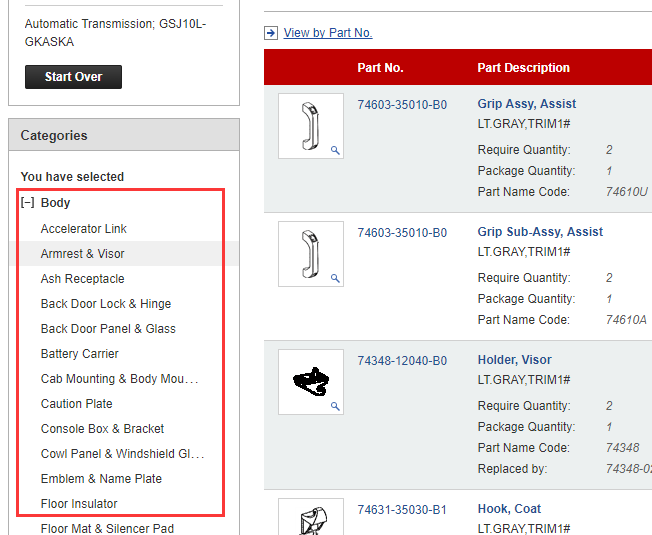 Click the categories to find and view parts in this category. Select the category that has the part you are looking for. Try searching in other categories. 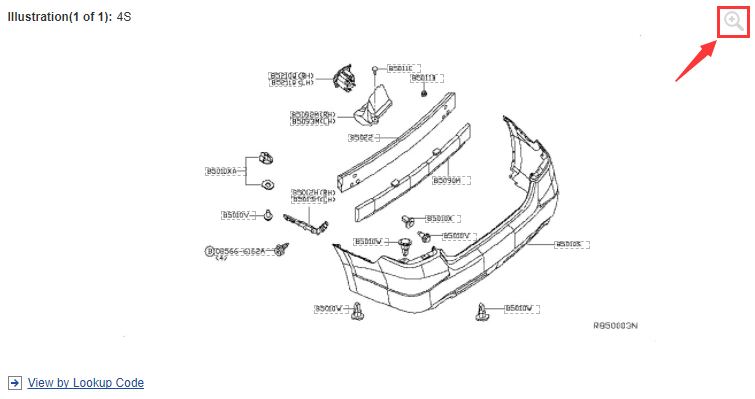 The part names in our parts catalog are OE descriptions. They may be different from conventional names. Explore the other related categories to see the different part descriptions that will come up. Select the category which you estimate will have the part you are looking for. Specifying your vehicle will only give you parts that fit your vehicle. It will make your part search easier and faster. 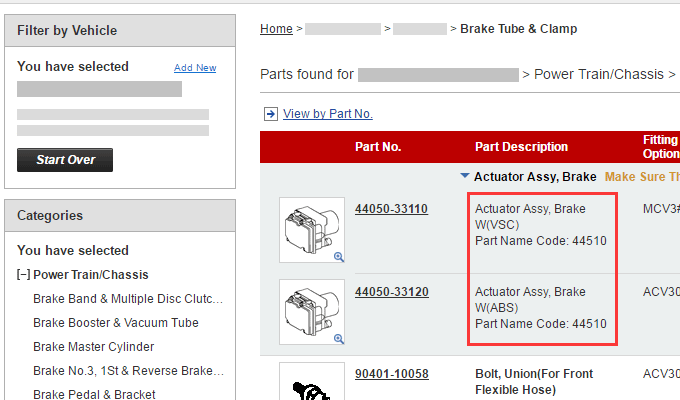 Once you've selected a category, scroll through the part diagram and part descriptions to locate your part. Click the to zoom in on your part image (if available). 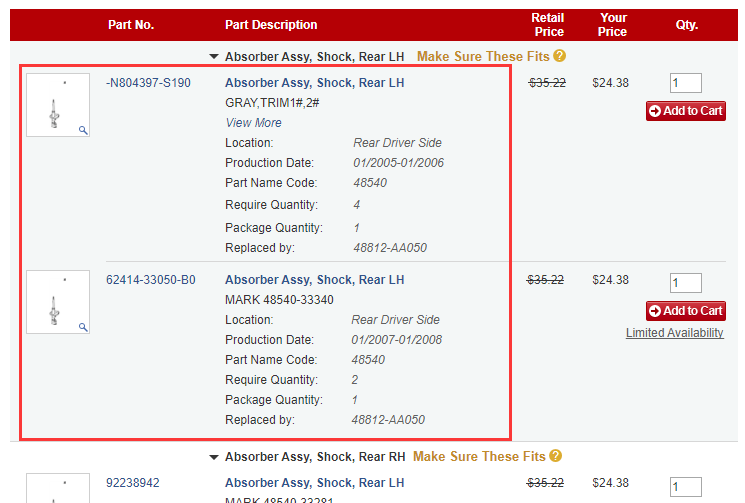 If multiple part listings are found, select your vehicle options using our Filter by Vehicle feature to narrow down your results. If you have input your vehicle filters and it still shows multiple parts, read the part description details to select the one that best matches your needs. If multiple illustrations are found, select your vehicle options using our Filter by Vehicle feature to narrow down your results. If you have done this and multiple illustrations still remain, hover over an illustration to view more details, then select an illustration to view its particular parts.